It’s all happening at Buckfastleigh! 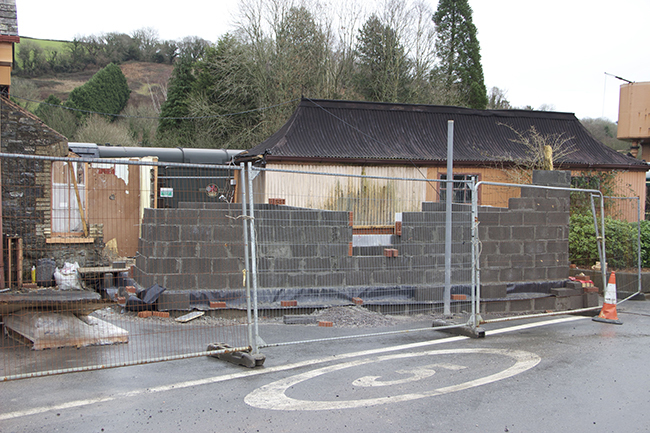 As promised, work has started on demolition of the toilet block at Buckfastleigh station, with contractors moving on site today (Monday 06 January 2014) to start the job. Electricity had been disconnected last week. 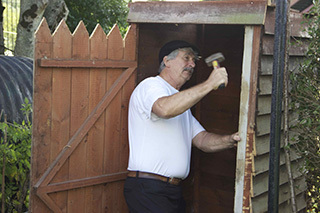 Alternative facilities remain available in the Refreshment Rooms, and in the wartime garden, where in August 2013 Dennis Taylor is seen working on the new state-of-the-art earth based sanitation facility. 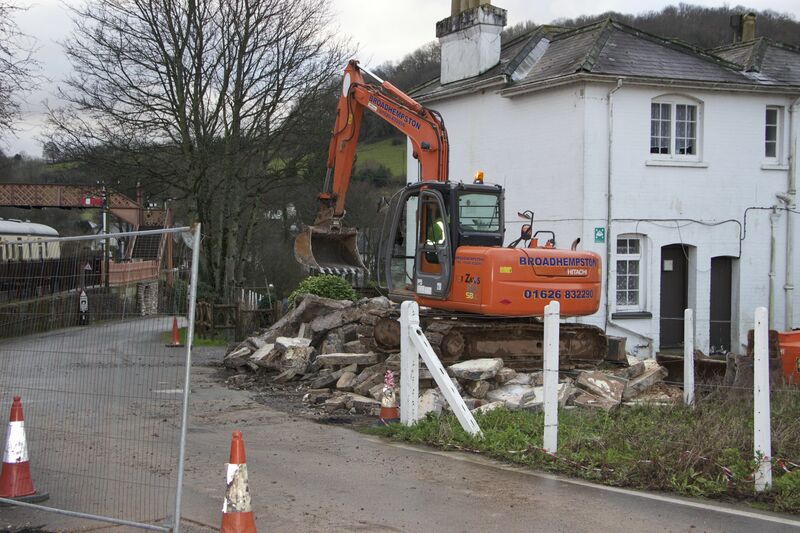 The pictures below shew the state of play on Thursday 09 January (left) – that’s the remains, under the digger. The rest was in the skip. The photograph on the right, taken today (12 January 2014), shows the footings already in place. A quick look at the back of the pagoda shows that urgent attention was needed while access was possible, and this should have happened today, with replacement corrugated sheeting being fitted by volunteers from SDR Engineering. 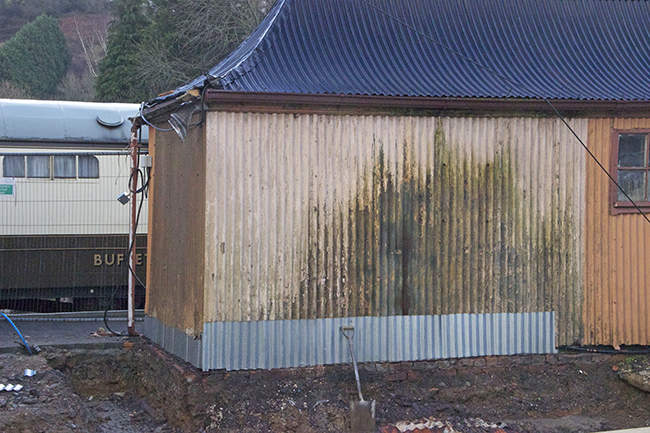 The photograph below taken 13 January 2014 shows the back of the pagoda and the replacement corrugated sheeting fitted by volunteers from SDR Engineering. 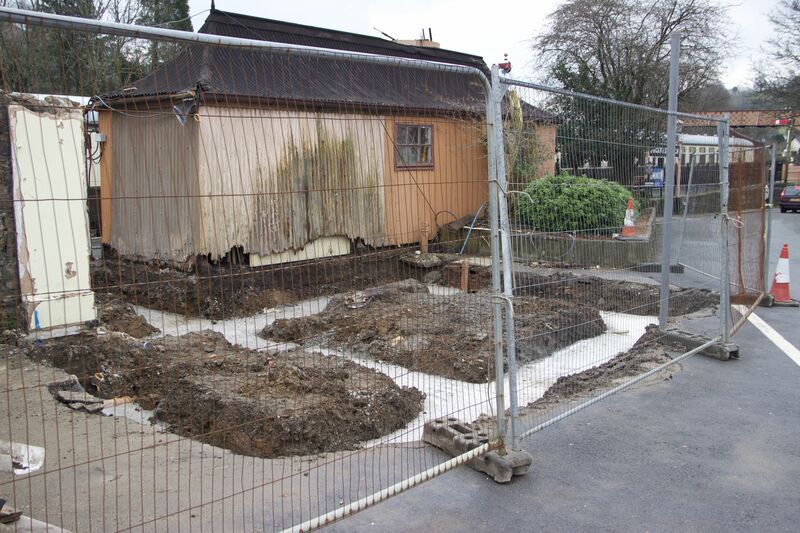 The photograph below, taken on Monday 20th January 2014, shows the new concrete slab cast for the toilet block. 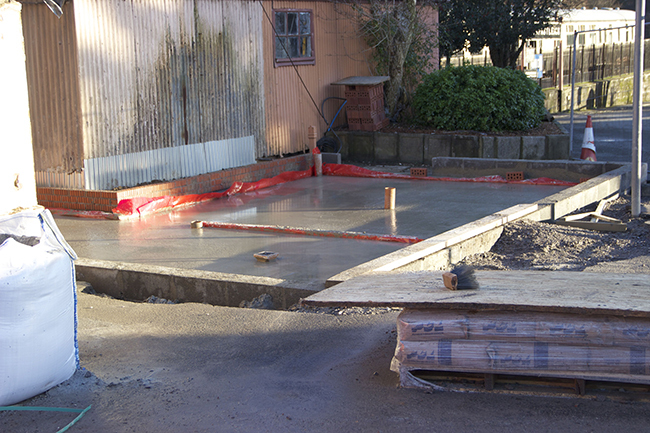 The new toilet block concrete floor slab cast recently. 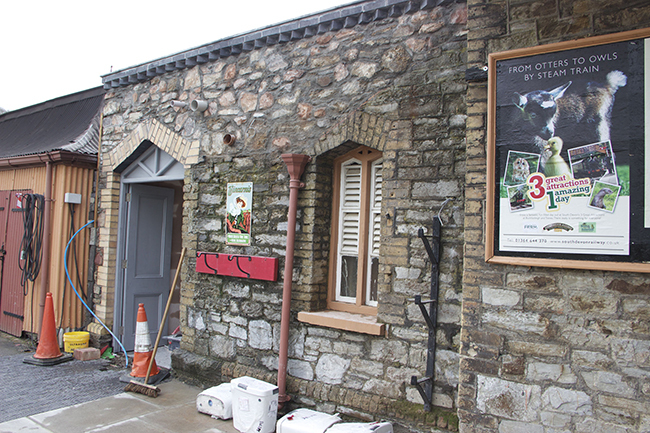 The photographs below, taken on Friday 24th January 2014, show the new custom windows manufactured by a firm in Newton Abbot, and the exactly match the originals in the main station building. The sills are hardwood. The blockwork walls are now growing by the day and there will be a plinth, capped with white brick, to match the existing building. 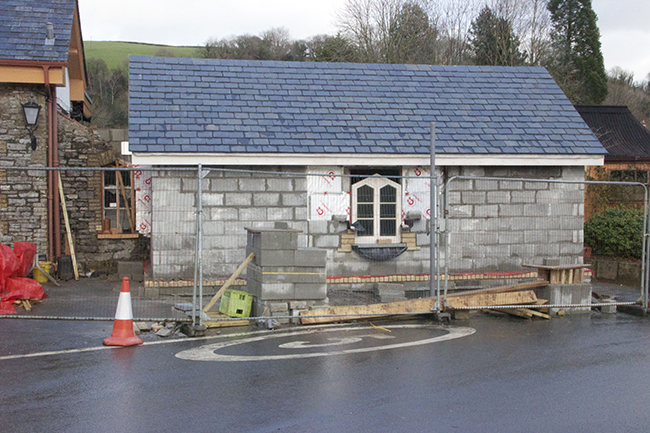 The new toilet block windows have been custom made to match the main building. 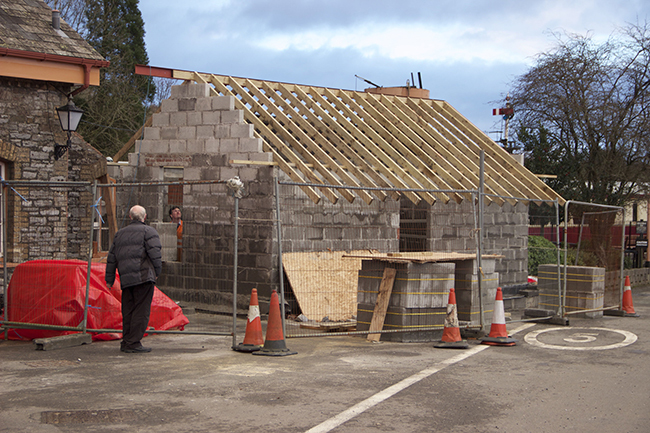 Herewith the latest pictures of the toilet block showing the roof taking shape. Denis Johnson and Alasdair Page inspect the work in progress. 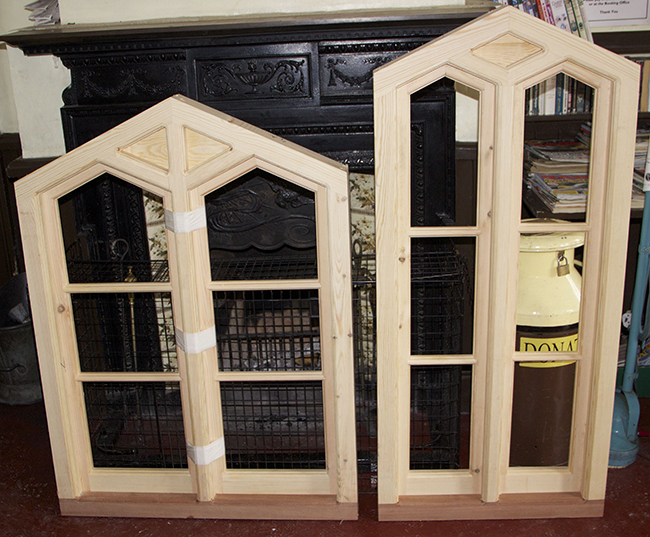 The windows in the earlier photos will go in the apertures shown here. 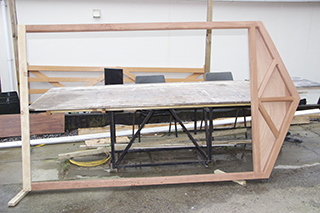 The new doors and frame were pictured the day they were delivered to site (06 February), and will form the main (and only entrance) from the platform. 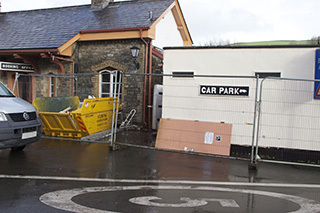 The other photo shows the two new windows being fitted to the main station building. We understand that others will be replaced as funds permit. 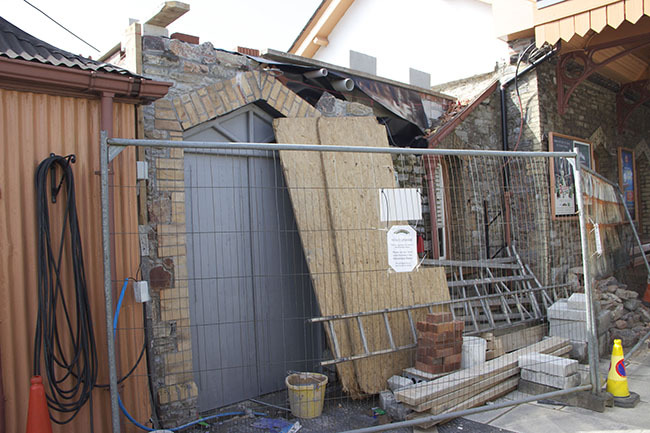 New toilet block gains roof timbers. 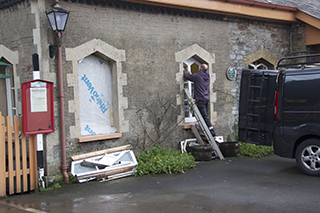 Buckfastleigh staton building also gets new windows. New toilet block doorframes. 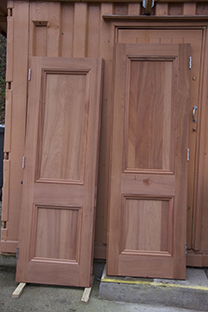 New toilet block doors. The latest picture of the toilet block shews the outer skin going on, whilst the insulation is installed between the walls. 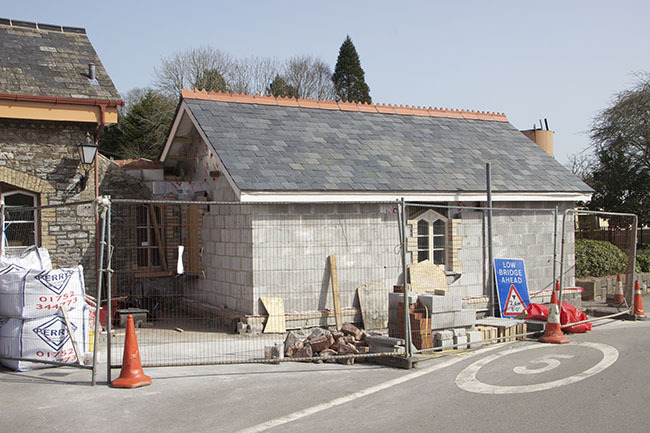 Slating the roof is complete and the first of the new windows is going in: note that it matches the originals in the main station building, and that the reveals use matching yellow bricks. This is a welcome attention to detail, albeit in the nearest modern equivalents. 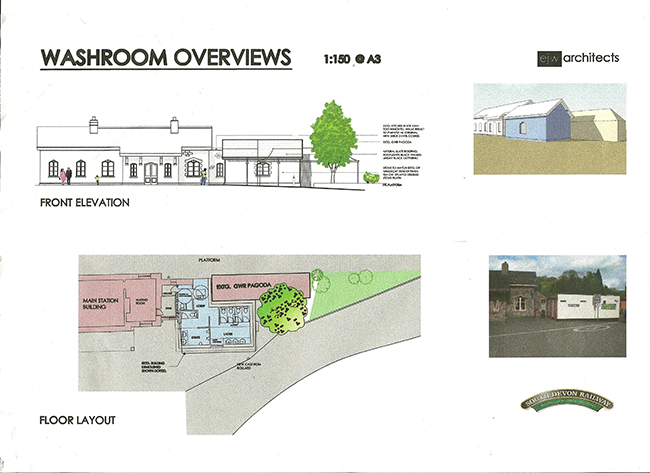 The latest pictures of the toilet block shew forecourt and platform sides of the toilet block. 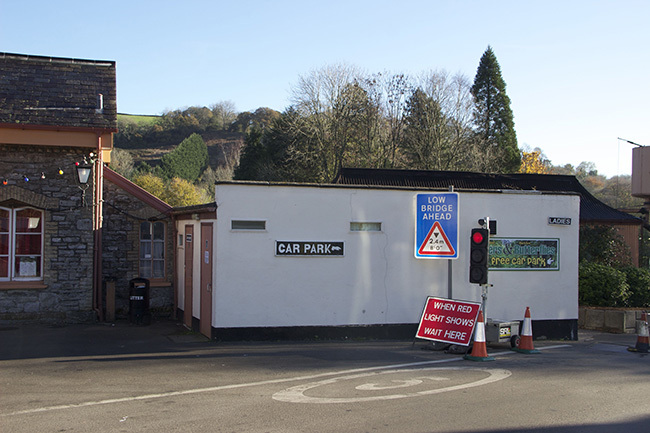 Note the forecourt side is just awaiting the final render finish and that the roof line on the platform side is being returned to its earlier profile. 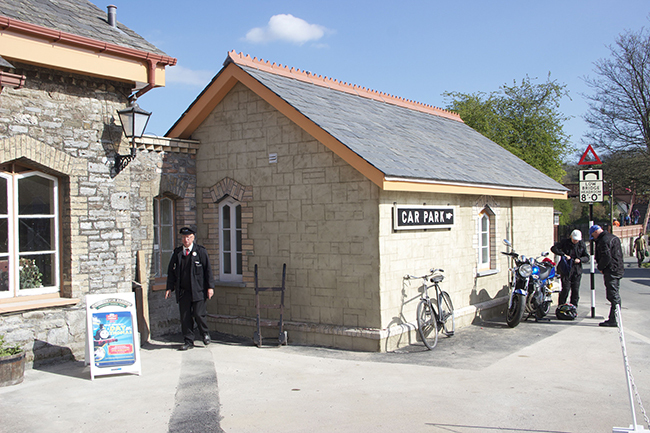 The platform side of the toilet block has gained its stone cladding so it resembles the original building. Unfortunately the original stone supply was exhausted many years ago. 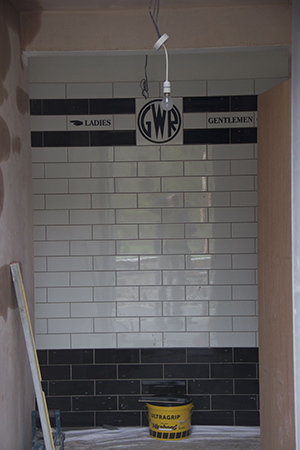 The tiling has been produced to replicate that used by the GWR. 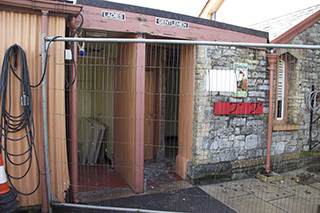 The 18th April 2014 was the momentous day the new toilet block opened to serve our customers. 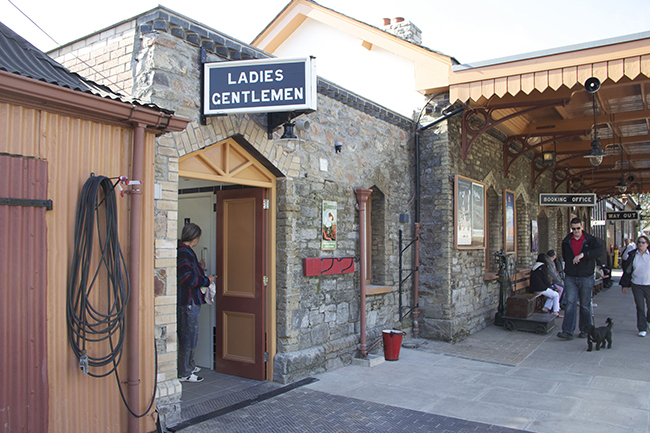 There's still some snagging to do but the greatly improved toilet facilities were made available for our Easter “Delivering the Goods” gala. The platform side of the Toilet block complete with signage, luminaire etc.